JANESVILLE—A Janesville developer plans to use the proceeds from the sale of one of the city's largest commercial buildings to construct three others and expand a fourth. Jeff Helgesen recently sold the Helgesen Industrial Center at 2929 Venture Drive to a company that focuses on the acquisition, ownership and management of industrial properties. The property is 100 percent leased to two companies: Miniature Precision Components and Deere & Co. The buyer's identity has not been released because it is a publicly traded company that has yet to announce the acquisition in the public markets. Helgesen Development Corp. sold the building for $24 million, Helgesen said. According to city records, it is assessed at $19.9 million. Helgesen built the 700,000-square-foot building in 1999, and over the years, it was primarily home to suppliers of the General Motors' plant in Janesville. When that business evaporated at the end of 2008, Helgesen invested nearly $3 million to renovate the property for new tenants. Helgesen said he will use the proceeds to build three other buildings across Beloit Avenue from the Helgesen Industrial Center. The first will be a 300,000-square-foot building at 202 W. Venture Dr. It will have a flexible interior design to accommodate tenants in need of 50,000 to 200,000 square feet. The second will be a 225,000-square-foot building on West Venture Drive just to the west of Cummins Emissions Solutions. It will be a single-tenant building, Helgesen said. Just south of that building, Helgesen plans to construct a 65,000-square-foot building that will become the home of Helgesen Development Corp.'s field operations. Jay Winzenz, the city's director of administrative services, said the city will consider building a road off of Venture Drive to reach Helgesen's office. “Progress Drive,” he said, has long been considered for the city's plat, and it's likely to be discussed formally by the city council in coming weeks. “It would make sense that if you have a new building there, you need access to it,” Winzenz said. Next spring, the city will install traffic signals at West Venture and Beloit Avenue. That will provide better traffic control and gapping for trucks accessing Beloit Avenue from both West Venture and Venture drives, he said. Winzenz said the city also will take advantage of planned state improvements to County G.
The state's Department of Transportation plans to install double right-hand turn lanes from northbound County G to Highway 11. The city owns a certified shovel-ready development site just to the southwest of the intersection. 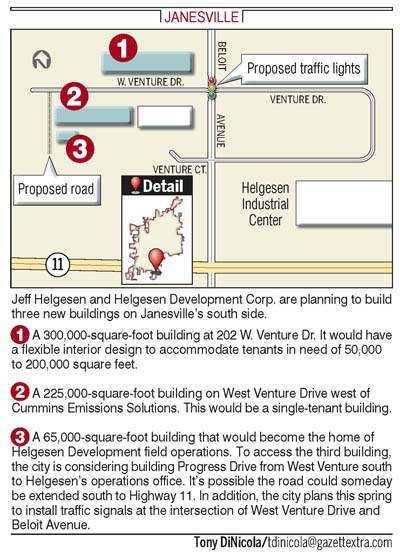 In advance of development there, the city will lay conduit for traffic signals under County G.
Over on Janesville's east side, Helgesen is planning a 120,000-square-foot addition to his building at 505 S. Wuthering Hills Dr.
That 110,000-square-foot property is currently leased by Cummins Emissions Solutions, which also rents 187,500 square feet on West Venture Drive. Needing more space, Cummins opted for the second location earlier this year, and now Helgesen will expand it. While he doesn't have specific tenants in mind for the two new buildings planned on West Venture, Helgesen said he is optimistic about prospects.